These Augusta brand Polyester / Spandex Compression Shorts are very affordable & super comfortable. 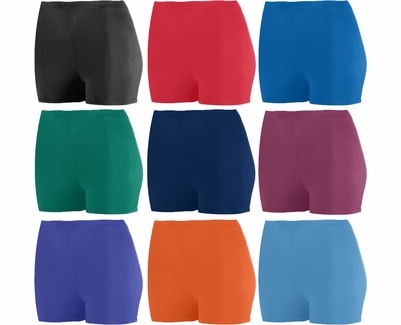 Volleyball Spandex Shorts have a ladies Low Rise Fit waistline and the popular 2.5" long inseam. Wear these Shorts for Volleyball, Running, Cheering, Softball, Working Out, or practically any Sport & Exercise Activity. � 90% Polyester & 10% Spandex knit; � Anti-Microbial, Odor Resistant & Moisture Wicking fabric to keep you Dry and Comfortable; � 2.5 inch Inseam; � Tagless Label for comfort; � Low-Rise Ladies Fit; � Covered Elastic Waistband; � Double-needle Hemmed Bottom. Augusta Polyester Spandex Shorts Sizing Chart: (Waist) - approx. 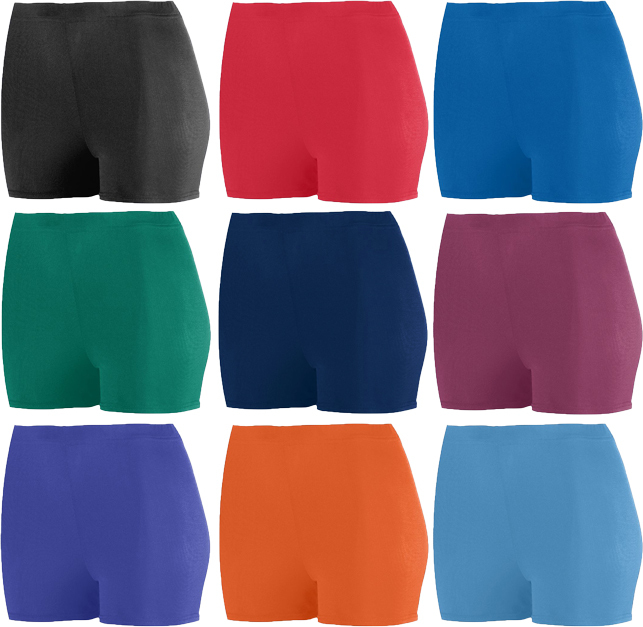 Ladies Poly / Spandex Athletic Shorts are available in 9 Colors: Black, Red, Royal Blue, Dark Green, Navy Blue, Maroon, Purple, Orange, and Light Blue. Color is bold. Fit is great. No riding while playing. We will buy again. Bought these for my daughter who is 11 and a first time volleyball player. We were not thrilled when the coach told us the required attire is spandex shorts. The one's I found in the store were so small. I was so glad to find these online where I could actually choose the inseam size. These are great and not too short. I bought them a size bigger for the roomy look. They fit her great and she is comfortable.